Hey everyone! I hope your week is going well! I wanted to share a few new pieces I got this past week and show how I'm using them in my home. Recently my mom, sister and I discovered the cutest home decor shop in Mansfield called The Rustik Market. We quickly became obsessed! This place is the perfect modern farmhouse shop. I want to buy everything item in that store. The owner carries a lot of the same items that Joanna Gaines does at Magnolia Market. If you are in the Mansfield area you have to check out this store. I will apologize to your wallet in advance. I got this chicken wire vase and florals along with this wooden caddy and black votive holders from The Rustik Market. As you can see from these items, the store is spot on with the modern farmhouse trend. This One Love sign is from Hobby Lobby for 50% off. I love shopping at Hobby Lobby. I always find something I love. This Stay Awhile sign and blue vase are also from Hobby Lobby and both 50% off. 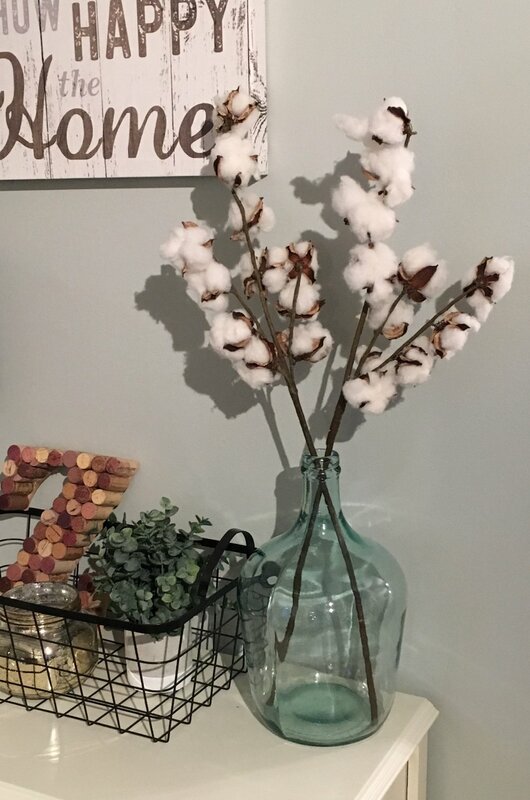 I have been looking for a vase like this for a long time and was so excited to find it, and on sale! Win! And of course I love the Stay Awhile sign. It's the perfect addition to my little Rae Dunn display table. Do you recognize that black votive? That's another one from The Rustik Market! I got three of them and two fit perfectly inside the wooden caddy so this one was perfect inside my glass lantern. I love to get new items to change up my decor and create a fresh new space. It's fun to switch things up every now and then and bring in some new pieces. And when you get things half off, you can't say no!